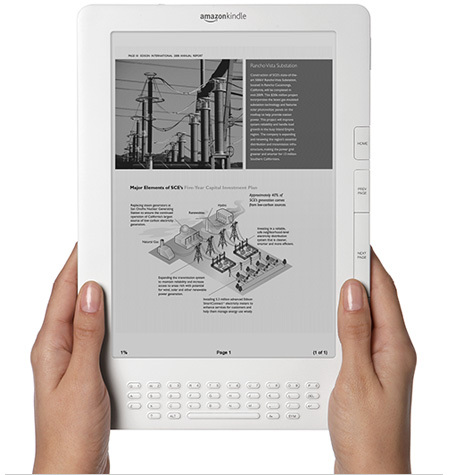 Amazon is really trying hard to make its Kindle eBook reader to become a multi-function device – much like the Apple iPad. But I guess, due to the limited technical capabilities of the Kindle, making it at part with the iPad in terms of multi-features would be a hard feat to accomplish. Well, at least Amazon is trying and its latest effort will be rolled out with the new firmware Â version 2.5 upgrade for Kindle – Facebook and Twitter integration. Well, it’s not really a full Twitter and Facebook integration since this would be pretty hard to accomplish. What the new feature will let you do is to let you share book passages with friends on Facebook and Twitter directly from your Kindle. Unfortunately, that’s just how far Amazon can probably stretch the Kindle’s social capability. Kindle’s firmware upgrade will be rolled out automatically via OTA to all Kindle users in the coming days. Barnes and Noble Gives Nook More Features, and Games! Whether we like it or not, we have to give Apple some credit for releasing its magical iPad tablet. Despite its shortcomings and minor flaws the iPad has managed to stir up the otherwise sleeping tablet computer industry and the e-reader market. Several brands are now in a rush to come up with something better than than the iPad. For Barnes and Noble it’s much easier to do this because Nook is already out even before the iPad hit the market. So, what B&N can do right now is update Nook’s features and make it a better e-reader than the iPad. And it is doing this right now as it announces some new features for Nook such as Read In Store and the addition of some games that Nook owners can play on their device. These were made possible via a software update to v1.3. The beta Read in Store feature allows Nook owners you to read ebooks while your inside a Barnes & Noble store. You Nook will automatically connect to the Nook online bookstore and let you read titles from the B&N online bookstore even if the books are physically out of stock. While inside the store, you can read ebooks up an hour per day. B&N also plans to make some current edition newspapers and magazines available for in-store reading soon. â€œOur digital customers will feel at home in our stores with Read In Store, which puts a digital spin on the popular Barnes & Noble bookstore experience that millions of our customers enjoy each day. At no cost, NOOK customers can browse through our robust collection of digital content while enjoying their favorite beverage in our cafÃ©,â€ said Tony Astarita, Vice President, Digital Products, Barnes & Noble.com. In addition to these, Barnes & Noble has also included new games and other entertainment features to Nook including Chess and Soduku. Nook v1.3 is available to download from www.nook.com/update or you may want to wait for automatic update in the coming weeks. Our apologies for starting this week with yet another iPad-related news. But is there any other significant tech-related news today other than the iPad? Anyway, this news is pretty interesting. Â According to Piper Jafray’s Gene Munster, majority of the iPad early adopters are Â Apple product users. Based on the survey of 448 iPad buyers, 74% were also Mac users with 96% of them planning to continue using their Macs despite having the iPad. The survey also revealed that 66% of the iPad buyers are iPhone owners and only 1% of them thought they could replace their iPhone with the iPad. It only goes to show that iPad buyers are aware that their new magical device was not meant to replace the Macs. Now, here’s another interesting point revealed by the survey – 13% of those who were surveyed owned the Amazon Kindle. And 58% of them are planning to replace their Kindle with the iPad. Moving on the specific iPad results, the survey also found out that the most popular iPad Â was the 16GB Wi-Fi only version, 39% of the respondents bought these model. Only 32% bought the 32GB and 28% bought the 64GB model. As to Â how they are planning their newly bought iPads, 74% of the respondents say for surfing the web, 38% for reading books, 32% for email, 26% for watching video, 18% for playing games and only 8% for listening to music. Call it coincidence or a a deliberate attempt at possibly spoiling the intensifying excitement over the release of the iPad. But Amazon’s recent airing of two TV ads for Kindle is a sign that the company is not just going to let the iPad steal the Kindle’s existing dominance on the e-book market. The two TV ads features are short snappy and trendy clips showing the theme “books in 60 seconds.” Meaning, that’s how fast you can get hold of a full edition of a published book in your Amazon Kindle, through its 3G wiresless connectivity or via the Internet. The Kindle TV Ads are pretty well done, colorful and able to send the message that the Kindle can bring “colors” to what you read. Interestingly, Amazon has commissioned airing of the two commercials into prime time on major channels. Makes us think that Amazon has really spent a lot to push their campaign. And of course, it shows how serious they are in staying competitive against the iPad. Here’s the other Amazon Kindle TV commercial.